Blue French Roman Hyacinth. Let me introduce you to the subtle beauty of this hyacinth. It’s not as showy as its cousin, the Dutch hybrid, but it has many more advantages. It will send out more than one flower stalk from a single bulb. Plus the bulbs will naturalize, bloom annually, and multiply over the years. In other words, unlike their overdressed Dutch cousins, they are definitely NOT high maintenance. I purchased my bulbs through The Southern Bulb Company. In fact, all my perennial bulbs have come from there. 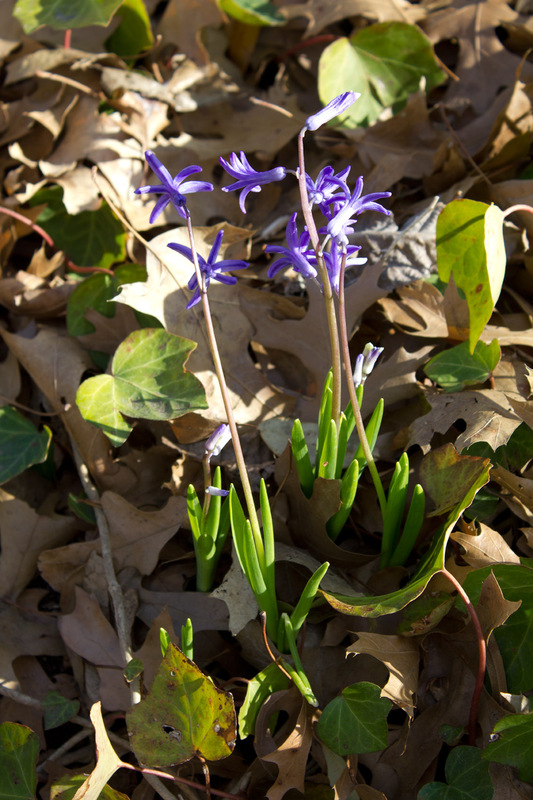 My spring bulbs are scattered throughout the parkway between the sidewalk and the street. If you’re wondering about the dead oak leaves, I purposely left them there after they fell to protect the English ivy from our winter’s hard freezes. In the next couple of weeks, I will be hand culling them out along with my other numerous annual spring pruning chores. Blue French Roman HyacinthbulbsSouthern BulbsThe Southern Bulb Co.